Do you have a child involved in afterschool activities that seems to be in a great deal of stress because they have no time to complete their homework assignments? Do you have a child who spends more time working on projects and homework and less time with family and friends? School-life balances can be difficult for some children because of the lack of time management skills. Also, an increase in homework given by teachers leads to possible disorganization. When those restless nights of baseball or soccer practice run into homework time or even family outings, one must look past the stress of the situation and find the potential in learning to become more organized. Being organized is the best way to find peace and productivity in work and life. Below are four (4) tips to help students and parents with time management as well as to help create a well-balanced life using the power of organization. As the school year begins and afterschool activities resume to their regular schedules, using a calendar can be a lifesaver in providing organization to students and parents. 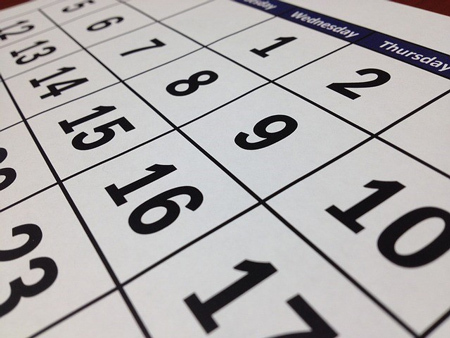 First, obtain either a physical calendar that is placed in a central meeting location, or have an electronic one in which dates and times can be added via a phone, tablet, or computer. Whenever a new event occurs or is about to happen, add it to the calendar and set a reminder. This will warn you in advance of the upcoming appointment. A calendar is meant to bridge the gap between confusion and stress, thus it’s a great tool to use every day! No matter the grade level of the student, a planner can help bring order and structure to a stressful time student. 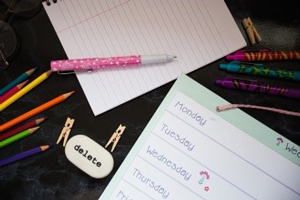 A planner, the same principles as a calendar, can also be a physical or electronic tool which can be used for logging assignments, homework, projects, or social events. A planner can be a useful tool to students because it allows them to look ahead and see what is coming up due. A weekly menu thought out in advance really helps with managing. A family can create a weekly menu from the Saturday or Sunday prior to the upcoming week. This allows everyone to have a choice in what they would like to eat throughout the week. A good way to do this is to find recipes online (Pinterest is one idea) and shop for the ingredients all in one shopping trip. Nowadays, some people prefer to order their groceries online and have them delivered. This also can save time. This simple weekly planning of a menu is an easy organizational strategy that helps put one’s stress and weeknight tensions at ease. How many times have you thought about all the assignments and activities you had to do and realized that you were stressed before the day even began? When the stress of certain situations begins to grow, our children’s minds become overwhelmed, and sometimes they feel lost. That is why managing time is so important. When a child can break down the day into smaller tasks or projects, one feels as though they are achieving a goal. A tool that is an excellent form of organizing oneself is to make a To-Do List and place all the tasks, big and small, on that list. Another great tool for managing one’s time is to prioritize and set goals for oneself to achieve success every day. This process is beneficial to both parents and children. The best part about setting and achieving a goal is being able to cross it off of a list knowing it is helping one move in the right direction. Once the goal is set and achieved, the next step is to make it into a habit. Finally, children should be celebrated when they reach their goal in the end. This will help keep them motivated to strive for success over and over again. School-life balance is important as you can see! Trying even one of the tips above will give your family a sense of relief and happiness. It will also free up time for you as a family to do some fun things together! Balancing is not an easy thing, especially when your children are involved in multiple activities. In the new year, help them find that one nugget from above that will make their life easier and put a smile on their face. If you need any assistance with helping your child meet the plan you have put into place, Dynamis Learning Academy is happy to step in. You may contact us at https://www.dynamislearningacademy.com/contact/ to schedule a free consultation. We will discuss where your child is currently and set a successful path for him to follow.